The Smarter Coffee machine is the sequel to their iKettle for tea lovers. This device is for those who love a cup of coffee (or three) in the morning and creates an even better way to start your day by remotely brewing your coffee through the Smarter mobile app. Using your smartphone you can adjust the strength of your coffee or even choose how many cups you would like to brew. Welcome home mode and wake up mode allow you to brew a coffee at a time to suit you. 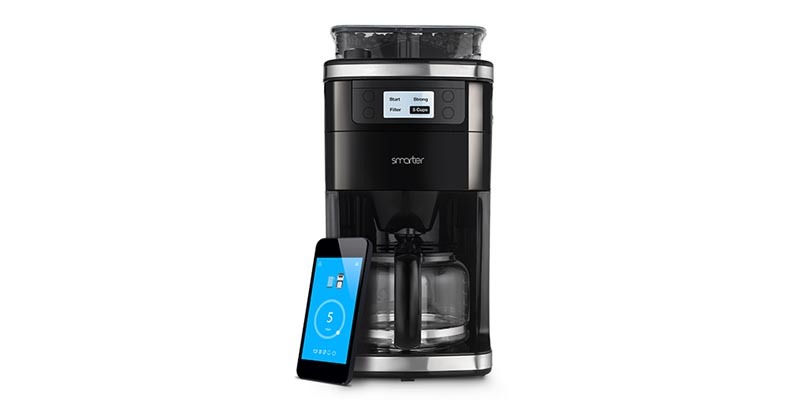 The new Smarter App is available with versions for iOS and Android, the app is easy to set-up and makes it really simple for you to control the wi-fi coffee machine from anywhere. You can choose anything from 1 to 12 cups to be brewed, then if you get held up you can even select an option to keep your coffee warm. Fresh coffee is now available at the touch of a button, but the big difference is that button can be pressed anywhere, even on your way home from work! Of course if you happen to be in the same room as the coffee machine, you don’t have to find your smartphone or tablet to brew a cup of coffee, there is a smart control panel on the machine which allows you to grind and brew fresh beans at any time, just pour in your coffee beans as normal, select the coarseness of the grind required, then start the machine directly from the smart control panel. This Smarter Coffee machine is available in Black, Red or Beige. You don’t need to choose the colour you prefer before buying, as all the coloured removable panels are included in the box, simply select the colour of panels to suit your mood or your kitchen décor.